According to a study recently published in the Journal of Family Psychology, women who have cold feet and get married anyway are approximately two-and-one-half times more likely to divorce. The study, conducted by researchers at the University of California, Los Angeles, asked 464 newly married couples whether they had doubts prior to getting married. 47 percent of men and 38 percent of women reportedly admitted to premarital doubts. Despite that more husbands than wives claimed to experience marital hesitation, researchers found that uncertainty on the part of the wife was a better indicator of future divorce. Four years after the study began, about 19 percent of women who admitted to pre-wedding jitters were divorced. Only eight percent of those who did not express doubts were no longer married. Additionally, approximately 14 percent of men who experienced feelings of hesitation prior to getting married were divorced four years later. Only eight percent of men who did not report cold feet were divorced. Neither spouse admitted to premarital doubts in 36 percent of the 464 couples surveyed. Four years later, only six percent of those couples were no longer married. According to researchers, people who were hesitant about getting married were also less satisfied with their marriages four years later. Lead study author Justin Lavne said it is unclear whether the doubts of those individuals who were uncertain about getting married were specific to their partner or the institution of marriage in general. Although no one likes to think their marriage will end in divorce, most people in California would benefit from executing a prenuptial agreement. A prenuptial agreement is a contract entered into by a couple prior to marriage that will normally outline any spousal support or property division obligations in the event of a divorce. In the State of California, a prenuptial agreement must meet strict criteria and may not address child custody and support obligations. If you are considering marriage, you should contact an experienced Southern California family law attorney to discuss the options available to protect your financial interests. If you have questions about prenuptial agreements, contact Doppelt and Forney, APLC . 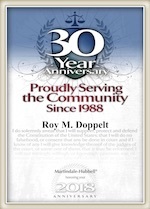 Mr. Doppelt is a hardworking Scripps Ranch divorce attorney who has more than 20 years of experience assisting clients throughout the State of California with all of their family law needs. Mr. Doppelt is available to help you draft a prenuptial agreement that fits your individual situation. Doppelt and Forney, APLC serves clients in San Diego, Encinitas, Scripps Ranch, Linda Vista, and throughout Southern California. To schedule a free confidential consultation with a capable family law attorney, please do not hesitate to call Doppelt and Forney, APLC toll-free at (800) ROY IS IT (769-4748) or contact us through the law firm’s website.